Towerside is a new century nexus for people to live, work, learn, research, explore and engage. 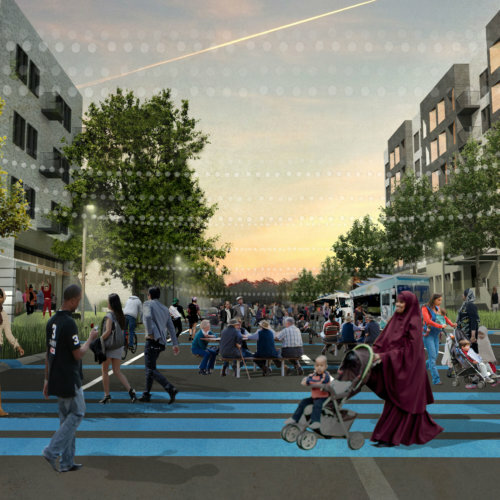 It represents a new way of thinking about a significant area of underdeveloped land in the heart of the Minneapolis/Saint Paul metropolitan region. It is a rich mix of spaces, places and activities supported by a district-wide network of innovative services and systems including stormwater management, heating/cooling and energy, as well as parking and a connecting green public realm. It's an inviting place with a catalytic atmosphere that will inspire a community that is diverse, inclusive, vibrant and responsive to ever-evolving opportunities and discovery. 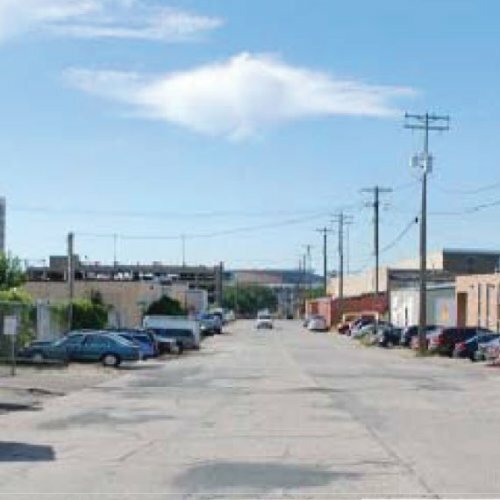 Towerside is 370 acres of opportunity extending from the University of Minnesota campus in Minneapolis east into Saint Paul. 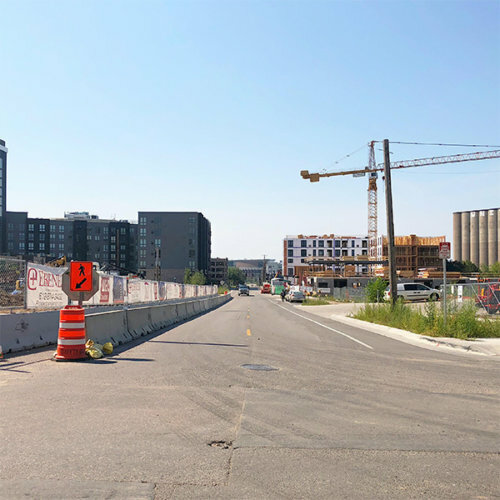 The district is served by three Green Line LRT Stations, at the center of the metro area interstate highway system and adjacent to the University’s medical, academic, athletic and bio-discovery research facilities. Towerside is the only designated innovation district in the region with the intent to bring together entrepreneurs, residents, researchers, developers and businesses within a new, equitable, restorative, healthy and arts-inspired community. It is a national model for developing a thriving urban community. Towerside is a 501(c)(3) nonprofit organization formed as an intentional partnership of non-profit and government agencies, higher education, community residents, businesses, and developers. Guiding principles include sustainable and restorative infrastructure. Innovative new businesses rooted in the arts and sciences. Small and large, long-standing and new businesses. Multi-modal connections and places. An emphasis on the new types of places, design, services and technologies that the market is and will be demanding vs. old disconnected and unsustainable models for development.  Inherent in Towerside’s principles is the need to create the atmosphere that will be the magnet for the people, the talent, the innovative thinking, the makers, doers and dollars we’re seeking. We must recognize and honor the DNA of existing neighborhoods and express its connection with what we have branded as Towerside. Art and creativity are essential to place-making as well as to creating a community of learning and discovery. As a reflection of lives and experience, arts, crafts and culture build bridges and make connections among neighbors, businesses and institutions. Arts and crafts can support activities across race, age, gender, ethnicity and religion. They foster community engagement, encourage and facilitate equity and diversity. The imagination and inspiration sparked by artistic pursuits energizes community life, civic dialogue, discovery and will contribute enormously to creation of the district’s atmosphere. The greatest contribution artists, makers, doers will make to Towerside is the way they think. It is not about a specific piece of public art or project, it will be their role in place-making, bringing imagination and inventiveness to urban problems and opportunities. This hard to quantify, important element demands our concentrated attention if we are to fulfill the promise for Towerside. Towerside Innovation District was formed to accomplish what no one organization could do alone. 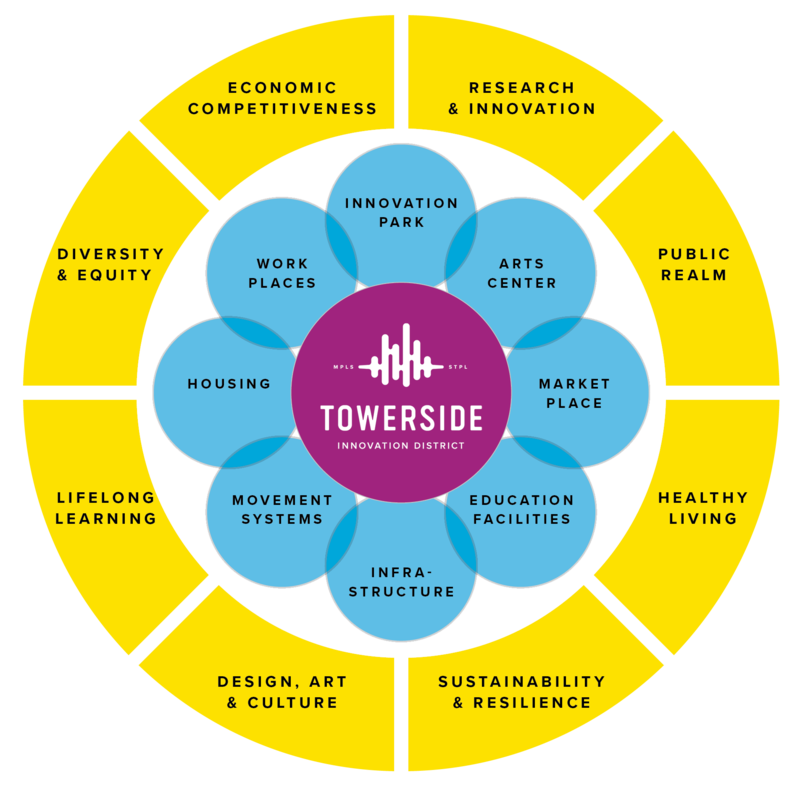 Towerside’s Partners and Leadership work to create framework guidelines, find early capital to support district-wide systems and advance the community-born vision with potential investors, developers, and the neighborhoods. This is achieved by providing technical support to a rich mix of real estate development projects and integrated infrastructure systems. These projects are woven into complementary community building initiatives and the fostering of an innovation culture to grow creative new economy startup companies and jobs.